Please note: None of the stories or background material listed on this page are my property unless otherwise noted. They are copyrighted to their respective owners (whom will be listed) and are stored without permission. No challenge to their status intended. ‘Come Sigismund, the hour is late, but I have one last mission for you,’ said a voice as stalwart as iron, yet supple as the finest silk. 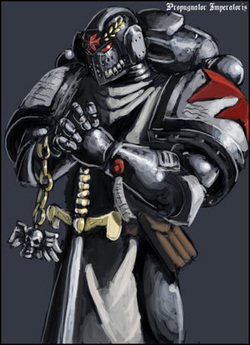 I follow my sire, Rogal Dorn, Primarch of the VII Legion into the forges. The billowing smoke of forge fire fills my lungs, endless rows of machines constantly churn, producing the unknowable quantities of munitions, armor, and weapons needed for the upcoming siege. I follow the golden armored demi-god into the depths of the mountain forges, into the sacred reclusium where the finest weapons and armor are stored, awaiting those worthy of them. He doesn’t speak, since learning of his closest brother’s treason, my lord has become colder and more distant. Even to me. His chosen knight. His favorite son. But today he is different. My lord desires companionship. He nods his head towards me, but I offer no reply, for none is necessary. We stop before an exquisitely crafted reliquary. Black crystal rests over top the Macraggian granite pedestal. At its center is the Legion icon, the Imperial Fist, crafted from white gold and onyx. But this icon is different. Inlaid in the gold are hundreds of infinitesimally small crosses fashioned from obsidian, edged in rubies. Each is identical to the one I bear upon my shoulders. The symbol is that of the first company, the Templars. For the first time since meeting my Primarch, tears come from my eyes. The Emperor himself had one of his own sons craft me a token of his favor. The feeling is indescribable. The hand of a god gently pulls me to my feet, and he smiles down at me. ‘You haven’t even seen it yet,’ his hand waves over the activation rune. The crystal, where once had appeared seamless, opens to reveal a suit of armor and blade more perfect than any other. The blade is blacker than the darkness of space, polished to a sheen beyond reason. The armor is etched with thousands of words, I recognize each as a battle honor bestowed upon the Legion since its inception. Gold and silver bracers reinforce the weaker joints; acid etched depictions of the Primarch and Emperor adorn its pauldrons. It is the most beautiful thing I have ever seen. The blade was fashioned from the same black crystal as the reliquary covering. One side, carved in exquisite detail, was the phrase ‘Dei Castigator’ and on its reverse ‘Imperator Rex’. It felt as air in my hands, and when the power rune was activated it seemed to pull the nearby light within it, radiating raw destructive power. Emerald lighting danced across its edges, while the golden hilt held an intricately detailed cross. Lord Ferrus had outdone himself. It takes a short time before my armor is entirely synced and ready. The servos and stabilizers move as nothing I have felt before. My entire body feels lethal. The ultimate armor, and it is mine. Full spectrum readouts play across the visor, ammunitions counters searching for a weapon, power levels read out at full capacity. I mag-lock the blade on my back and look to my lord for direction, and his cold demeanor returns. ‘In the eyes of your sworn lord do you swear this oath of moment?’ His face could be cut from the hardest marble. The stone man. You will know no remorse, for those you slay will have once been called brother.